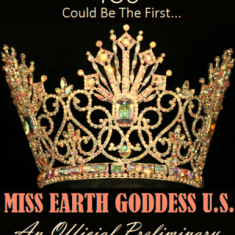 Updated September 19, 2016: The "Miss Earth Goddess" pageant changed the name of their competition to “Miss Planetary” International Pageants but there has been no change in management. The same rules, requirements, competition categories, and prizes offered still apply. The change in the pageant system’s name has come to ensure distinguishability from other pageant titles currently in the industry. All contestants start out in their state competition (which is an Appointed Queen program). The Appointed Queen program is an online application process which allows our contestants to compete for their state title without having any traveling, hotel, or wardrobe expenses. We award both state and local titles. No matter which title you win, you will be invited to optionally participate in the national pageant scheduled to be held in Las Vegas, NV.